Stay at the finest Manor Houses and Castles on a self-drive or chauffeur-driven tour of Ireland’s favorite beauty spots. Whether you choose the independence of self-drive touring or the relaxed worry-free experience of the services of a private driver/guide, you will capture the mood of friendly people in a legendary land of culture and conviviality. Meet your driver/guide or pick up your rental car on arrival. 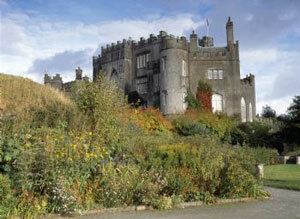 Visit Bunratty Castle and continue to Limerick for a tour of King John’s Castle. Drive south with a stop in the picturesque village of Adare. Continue to Killarney for a 2-night stay at Cahernane House. Relax after your journey. This evening take a horse and carriage ride to Muckross House on the Killarney Lakes. See the Gap of Dunloe and Kate Kearney’s Cottage. Take a tour of the Dingle Peninsula featuring some of Ireland’s most spectacular coastal scenery, including Slea Head and the Connor Pass. Dingle town is well known for hiking, fishing and sailing by day and by night for a lively restaurants, pubs and a traditional music scene. Tour the famous Ring of Kerry. For centuries artists and writers have celebrated this beautiful landscape where the contrasting mountain, lake, and coastal scenery is at its most spectacular. Options include a boat trip to the Skellig Islands, which was a monastic settlement in early Christian times and was raided by the Vikings in 810AD; it is now home to one of the largest sea gannet colonies in the world. This morning visit Kenmare and Bantry. Enjoy a boat trip to Garinish Island. Continue to Cork and visit Blarney Castle to kiss the famous stone eloquence. Tour Cork City and include a visit to the Shandon Bells, the gothic style University College, St Finbarr’s Cathedral, City Market and the Crawford Art Gallery. Depart Cork and visit the medieval city of Kilkenny, once the capital of Ireland in the middle ages. Tour Kilkenny Castle and shop at Kilkenny Design. Continue north to Dublin. Enjoy a visit to Dublin ‘s historic Georgian Squares or Walk through the Temple Bar area, which has become Dublin’s Left Bank! Drive to Galway City, home to many artists and craftsmen where you will find a number of excellent galleries exhibiting and selling their work. The city is buzzing with street theatre, music, restaurants, great shops and pubs. Enroute visit the magnificent monastic ruins at Clonmacnoise on the banks of the Shannon. Continue to Ballynahinch Castle, your home for the next two nights. Transfer this morning to Shannon Airport for your departure flight home. Drop off your rental car or say good bye to your driver/guide. Confirmed Reservations at Luxury Irish Castles & Manors for 9 nights. Concierge service in Ireland while travelling.